The 1 oz Gold Maple Leaf is the original denomination of the gold bullion coin that was first introduced in 1979 in order to compete with the South African Krugerrand. Other governments soon followed suit, with the Chinese Panda, Australian Nugget and Austrian Philharmonic, and others, introduced in the 1980’s. The Maple Leaf soon expanded its denominations and now has 1/20 oz, 1/10 oz, 1/4 oz and 1/2 oz versions released every year. The 1 gram Maple Leaf is the most recent annually produced coin, first manufactured in 2014. The 1 oz Maple Leaf measures 30mm in diameter, slightly more narrow than other gold bullion coins of its weight and purity. This means it’s thickness is slightly higher. The coin’s gold content is 31.11 g and it has a serrated edge. 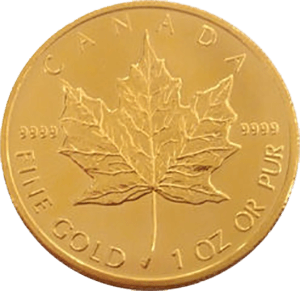 All Gold Maple Leafs produced after 1982 have a purity of 24 carats (99.9999%), making them among the very purest gold coins on the planet. This does mean that they can mark easily and therefore should be handled with a great deal of care at risk of the coin losing a significant amount of its value. With large parts of the coin also design free (clear) this can magnify the risk compared to other similar coins with more intricate designs. The 1 oz Maple Leaf has a face value of $50, although, as with all gold bullion coins, the gold content and its purity means its value far exceeds this. The Royal Canadian Mint, which produces the Maple Leaf, is one of the most active at fashioning specialist editions coins, with several versions produced to celebrate events that have included the Vancouver Winter Olympics. There are also coloured gold special editions and even a holographic design, which proved highly popular with collectors.